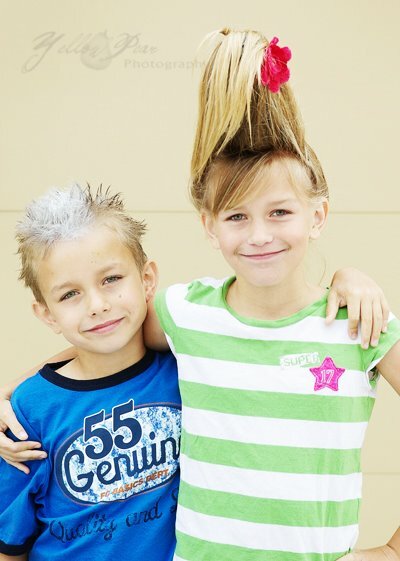 We had some crazy fun for Crazy Hair Day at the kids' school. 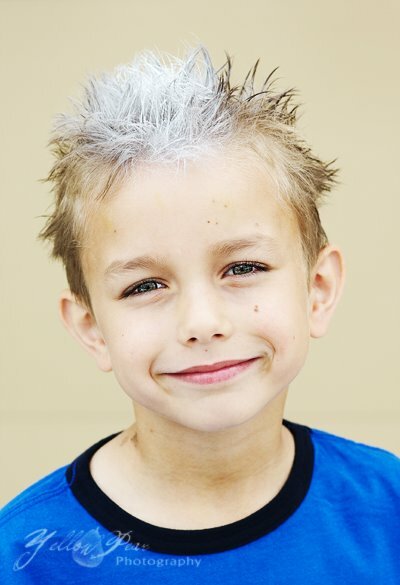 There's not a lot you can do with short hair...but luckily we had a little leftover colored hair spray from Halloween! Here is Miss Bindy Lou Who all the way from Who-ville USA for a quick visit. She likes to have her hair just so. ...can you guess how we did it?? It didn't take longer than 10 minutes. Update on the up-do! Yep Alicia Mae, you were dead on and Tonya Mae a close second. (Ha! look at that...both middle Mae's!) It was a bottle. A Powerade one to be exact. This is her 'after-I-undid-it' picture. You should have seen the back of her hair...there was quite a bit of hairspray! 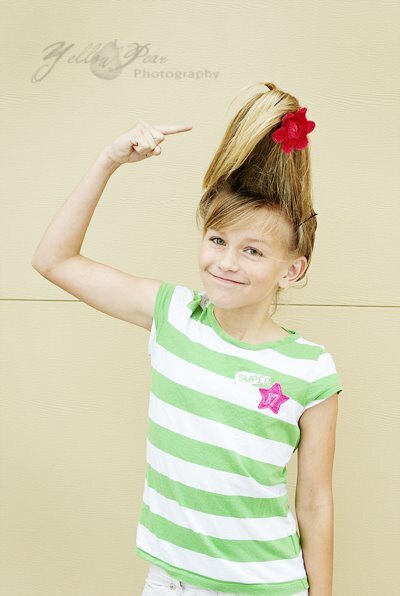 But it looked exactly, perfectly the same after a windy day of school, so apparently it was the right amount of hairspray. Also, she said she was getting comments and looks all day. Even the 8th graders would walk by and say, "Look, it's the girl with the bottle in her hair." Word gets around quick, eh?! I know how you did it, but I won't spoi the surprise...so cute! 10 mintues? my guess is a bottle or a few socks are hidden under there. i'm obsessed with getting volume in my hair (obviously never been successful though...) - can't wait to learn the trick! I was just going to ask how you did it. 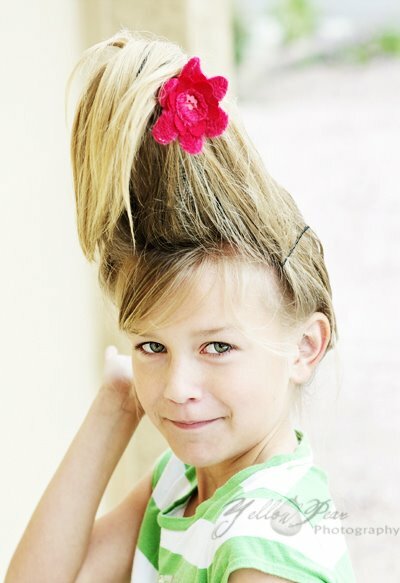 Hmmm... Did you put a piece of rectangular Tupperware™ on her head and cover it with hair?? Impressive! Between you and Jolene you guys should open your own salon! I can't wait to have all these fun days when Alex is in school. Looks like fun! M had the even shorter hair problem on Crazy Hair day. We didn't watch the calander close enough and had just cut off his Crazy long hair. I think they look Crazy Good! Oh, that is too funny. 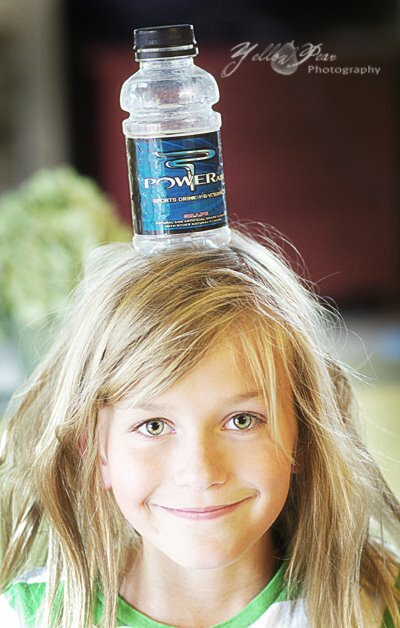 How did you get the bottle to stay on top of her head?? I can't really see how bobby pinning a bottle to the scalp would work... Did you use a staple gun or Gorilla Glue™?